Adoption today offers more choices than ever before. Expectant/birth parents considering adoption may feel overwhelmed with all the thoughts, feelings, and questions that come up in the process: How do you go about making an adoption plan for your baby? How can you ensure he/she will go to a safe and loving home? How do you know you are choosing the right adoptive family? At Adoptions With Love, there is a lengthy process that prospective adoptive parents must go through before getting approved to adopt. For each family, our trained staff completes a thorough screening process that involves background checks, multiple interviews, and home visits (called a home study). At our agency, every single expectant/birth mother can be as involved as she wants to be throughout the adoption process – even down to selecting the very family who will adopt her baby. If you are facing an unplanned pregnancy and thinking, ‘I need someone to adopt my baby,’ then read on for advice on how to find the perfect match. Thanks to the modern world we live in, information can be shared in an instant over the Internet. However, this can also bring some risks. Expectant/birth parents who take to the World Wide Web to search or post “looking for someone to adopt my baby” put both themselves and their baby at risk for unwanted results – the families that show up or respond to your search may not have been screened, background checked, or legally approved to adopt. That is why we recommend working with a licensed, well-trusted adoption agency like Adoptions With Love, to help ensure your child is placed with a safe, loving, and prepared adoptive family. Our organization is fully committed to placing every child in the best, most caring and secure homes possible. Choosing the best adoption agency for you is an important part of this process. Adoptions With Love is a full-service, private, non-profit organization that offers comprehensive, free-of-cost services for expectant/birth mothers nationwide. Our trained social workers will work with you to make an adoption plan that best suits your wishes and needs. We will help you find adoptive parents that meet your expectations, and that can provide the type of home you want for your child. We will guide you 100-percent of the way, both now and after the adoption takes place. At Adoptions With Love, we want you to feel supported and guided throughout this emotional journey. Together, we will go over all your adoption options, including how open or closed you would like the adoption to be, and give you profiles of the waiting families looking to adopt. You can take time to look through their profiles, read their personal letters to you, and choose the family that feels “right.” If you wish, you may even meet and get to know a prospective family. These decisions are entirely up to you. What kind of qualities do you hope your child’s adoptive parents will have? What kind of home do you want your baby to have? What kind of childhood do you envision your child enjoying? Are there any specific values you hope the parents will instill in him/her? These are some of the many questions to consider when deciding on an adoptive family. You may also think about whether you want your child to have siblings, or pets, or parents of a certain race or religion. 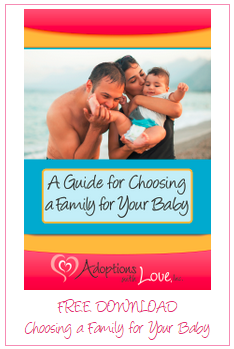 Thanks to the comprehensive profiles and photo books made by prospective parents, Adoptions With Love can share all this information with you. We will take the time to discuss your vision, to help you find the perfect fit. After hand-picking the right family, you may also choose to talk with them over the phone, or meet them in person, to get a better sense of who they are. Though you may not have planned this pregnancy, you can plan for your baby’s life. You have the incredible opportunity to choose an adoptive family for your baby. In selecting the adoptive parents, you can provide your child with an amazing gift: a life of opportunity, stability, and love. Knowing you have personally selected the perfect family for your child will likely bring great peace-of-mind for your decision and courageous leap. Click here for more information on choosing a family for your baby. Before you take to Google or social media to search for “parents to adopt my baby,” consider the safe and secure alternative of working with a licensed agency like Adoptions With Love. We will never let your concerns or desires go unheard. We want you to feel confident in both your adoption plan and the adoptive family that you choose for your child. ← Is an Open Adoption Agency for You?